The Colosseum is an iconic symbol of imperial Rome and it is one of Rome's most popular tourist attractions. 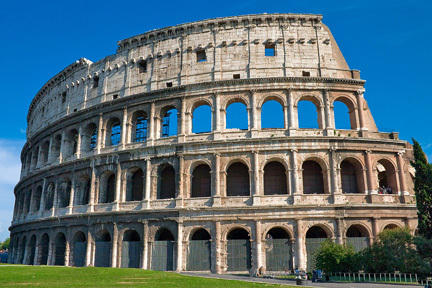 The name is derived from the Latin word 'colosseus' meaning colossal. This was in reference to the gigantic statue of the Emperor Nero which had been previously erected near the site of this roman monument. This is the arena originally known as the Flavian Amphitheatre. The name "Amphitheatrum Flavium" derives from both emperor Vespasian's and Titus's family name. It is an elliptical amphitheatre that was built in the centre of the city of Rome, Italy. It is the largest structure ever built in the Roman Empire and is considered one of the magnificent works of Roman architecture and Roman engineering. The Roman Forum was the central area of the city around which ancient Rome developed. Occupying a site just east of the Roman Forum, its construction began in 72 AD under the emperor Vespasian and was completed in 80 AD under his son Titus. Further architectural modifications took place during Domitian's reign (81–96 AD). It was built on the site of an artificial lake created by Nero in this valley in front of Nero’s Domus Aurea palace. Vespasian's decision to build the Colosseum on the site of Nero's lake can also be seen as a populist gesture as a gift to roman citizens, increasing the popularity of the Flavian dynasty. Unlike many other amphitheatres that were located on the outskirts of a city, it was constructed in the city centre; in effect, placing it both literally and symbolically at the heart of Rome. The massive amphitheatre had a capacity estimated at about 50,000 spectators. The amphitheatre was used for gladiatorial combats, mock sea battles, animal hunts, executions, re-enactments of famous battles, and dramas based on Classical mythology. This amphitheatre is an entirely free-standing structure. It derives its basic exterior and interior architecture from that of two Roman theatres back to back. It is elliptical in plan and is 189 meters (615 feet / 640 Roman feet) long and 156 meters (510 feet / 528 Roman feet) wide, with a base area of 6 acres (24,000 sq. metres). The height of the outer wall is 48 meters (157 feet / 165 Roman feet). The perimeter originally measured 545 meters (1,788 feet / 1,835 Roman feet). The central arena is an oval 87 m (287 feet) long and 55 m (180 feet) wide, surrounded by a wall 5 meters (15 feet) high, above which rose tiers of seating. The design of the Colosseum exhibits the latest creative trends in Roman arts, engineering, and architecture. The invention of concrete enabled this massive structure to be built quickly, efficiently and to great effect and all of this was accomplished with the highest artistic standard and in a highly skilled manner. Building materials used for Colosseum were stones such as travertine, tufa, and marble in addition to cement, tiles, and bricks. Colossal facade of exterior comprises three stories of superimposed arcades surmounted by a fourth story that had window openings. Each of the arches in the second and third floor arcades had statues. Each of the three tiered stories originally had 80 arches. 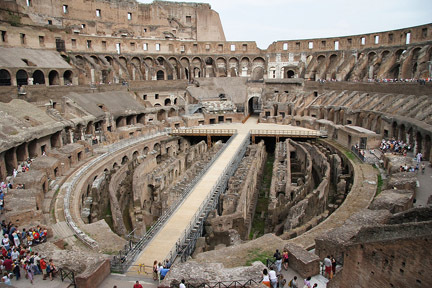 Thus Colosseum was ringed by eighty entrances at ground level forming the entrances and exits for the spectators. The 76 entrance gate arches were used by the ordinary spectators, plus four special un-numbered gates which were the Grand Entrances for emperors, nobles, and elites. The interior seating arrangement was in a tiered order that reflected the rigidly stratified nature of Roman society. The first tier, called the Podium was reserved for the most important Romans - emperors, priests, and Senators. Second tier seating was reserved for the non-senatorial noble class called the Equites, or knights. The third tier was originally reserved for ordinary roman citizens, the better, lower seats for the wealthy and the upper seats for the poor. The fourth tier of steep wooden seats which were set up in the gallery running around the very top wall of the amphitheater for common poor, women, and slaves. The arena itself was about 272 feet by 157 feet. It comprised a wooden floor covered by sand, covering an elaborate underground structure called the hypogeum (meaning "underground"). Little now remains of the original arena floor, but the hypogeum is still clearly visible. The hypogeum consisted of two-level subterranean network of tunnels and 32 animal pens. It had 80 vertical shafts which provided instant access to the arena for animals and scenery. Substantial quantities of machinery also existed in the hypogeum. There is evidence for the existence of major hydraulic mechanisms and according to ancient accounts, it was possible to flood the arena rapidly, presumably via a connection to a nearby aqueduct. Safety measures were put in place to avoid any disasters. The arena was separated from the seating areas by a massive wall, faced with marble. A large ditch provided more protection. The massive marble wall about 15ft high was built to prevent savage animals climbing over and reaching important people sitting on the podium.